We've just been really really busy! 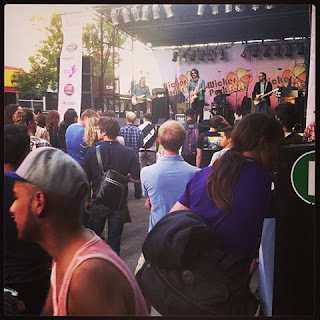 Wicker Park Fest was in the neighborhood a few weeks ago (if you followed us on Instagram you would have seen a pic, so maybe you should get on that - @raysbucktown) and proved to be a pretty solid way to kill some off time. A local acrobatic school - Aloft Loft - had a member working some promo for a drink company hanging from a crane on silks dispensing drinks to admirers below. Plenty of local and area bands kept the music going until a decent decided upon hour, and for once, we saw a perfectly full but not uncomfortably crowded street festival - with just the right amount of dogs to pet. 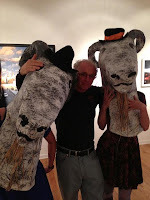 The Goat Party - a fundraiser for one of the neighborhood's biggest events - the Bucktown Arts Fest - is another event that we like to attend every year. It's also becoming quite the tradition for Ray to get his picture taken with the poor souls who are dressed up in giant goat heads dancing around the party. We donate a one-night stay every year to the silent auction so maybe next year you should attend and take a stab at bidding on some of the goods! A staff favorite was this shirt by transit tees, though even after a few glasses of wine Ray still wouldn't front us the funds to have a fighting chance at winning. So that's been our playtime as of late, but hopefully we'll have more time as the season slows down!